Ready to take on the challenge of organizing your scrapbook magazines? It doesn't have to be a chore… In fact, even a little organization can go a long way in de-cluttering your scrapbook space. 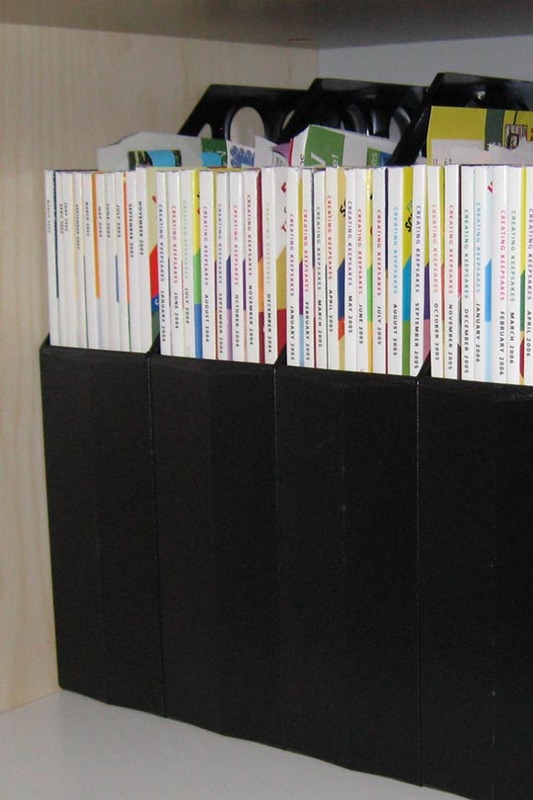 If you have stacks of magazines all over your house, or in growing piles on your scrap room floor, the quickest thing to do is get yourself a set of magazine holders. Using magazine holders, you can easily organize your scrapbook magazines (and idea books) by publisher and date, as I have in this picture. Over the years, I have collected a TON of magazines (well…maybe not a ton, but close) of scrapbook magazines and felt like they were taking up a little too much space, but I didn't want to lose some of the valuable information contained within. Why?... If there is a helpful article, favorite section or great layout that you would like to save, do what some will consider the unthinkable and remove those pages from the magazine. That way, you save the "good stuff," but get rid of the extra bulk, leaving you with extra space once you replace all the magazine holders with just a few binders. There is one additional option that you could use to organize your scrapbook magazines and that is an altered journal. If you're looking to save entire pages of an article this won't work for you, but if you prefer to keep only small clippings of a page, or summarize an article so you only keep those core ideas, then this could definitely work for you. To make an altered journal, simply select a traditional journal and then decorate with patterned paper, ribbons, buttons and tabs to separate the different sections. Once you're ready to throw out your magazine, simply clip away and adhere to your journal pages. So, as you can see, organizing your scrapbook magazines doesn't have to be chore. In fact, it may just give you one more reason to be creative.